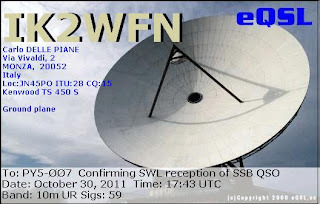 eQSL recebido: IK2WFN, Monza, Italy, 28MHz, QSO w/ LU1VM (Contest CQWW). 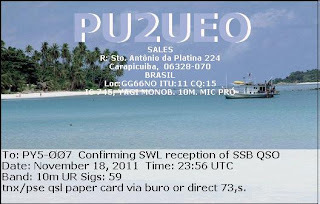 eQSL recebido: PU2UEO, Carapicuíba, SP, Brasil, 28 MHz, QSO w/ DU9RG. 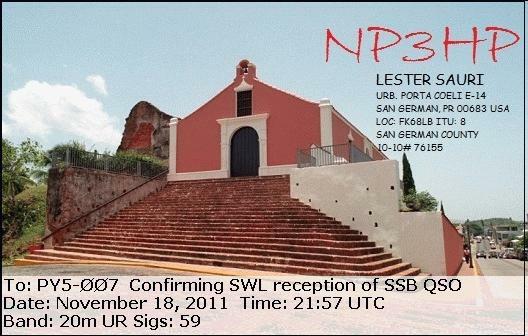 eQSL recebido: NP3HP, San German, PR, United States, 14 MHz, QSO w/ V51B. 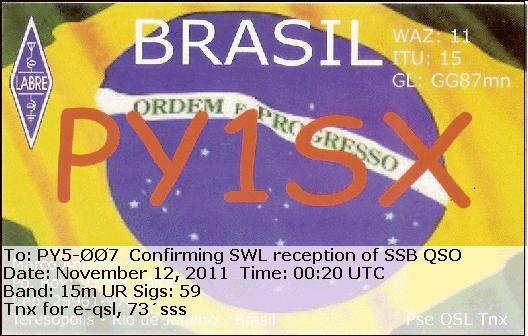 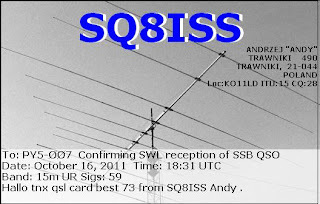 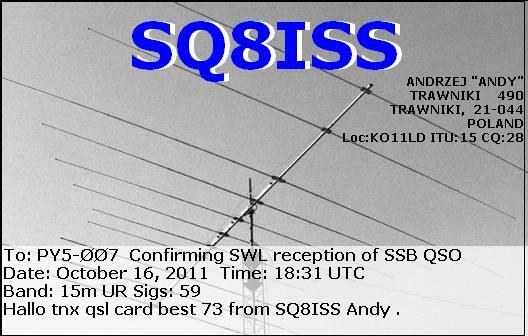 eQSL recebido: SQ8ISS, Trawniki, Poland, 21 MHz, QSO w/ CX8DCM. 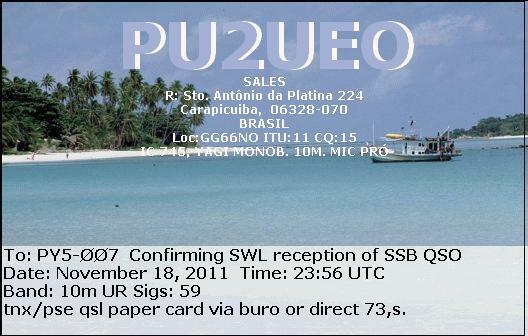 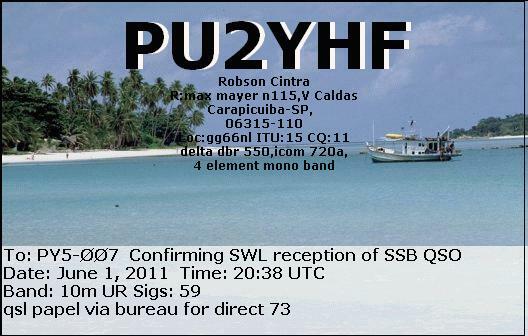 eQSL recebido: PU2YHF, Carapicuiba, SP, Brasil, 28 MHz, QSO w/ EA1ALE, CT5GFE. 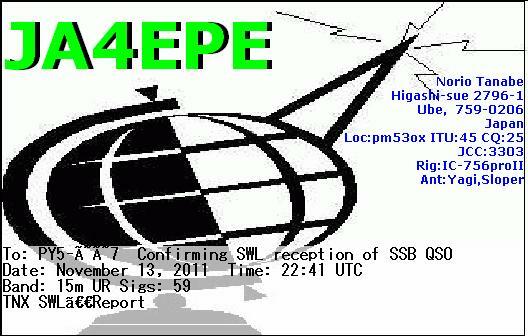 eQSL recebido: JA4EPE, Ube, Japan, 21 MHz, QSO w/ KP2B. 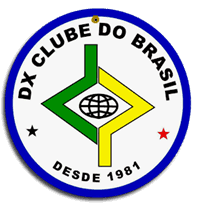 eQSL recebido: PP5EJ, Joinville, SC, Brasil, 7 MHz, QSO w/ PT2CVA (Concurso CVA). 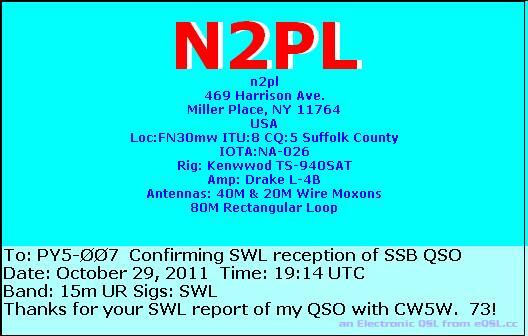 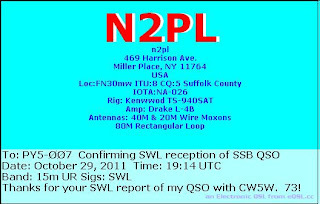 eQSL recebido: N2PL, Miller Place, NY, United States, 21 MHz, QSO w/ CW5W. 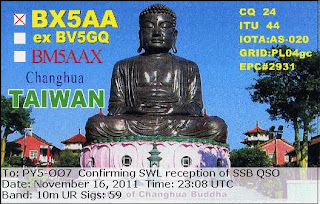 eQSL recebido: BX5AA, Changhua, Taiwan, 28 MHz, QSO w/ W4HET. 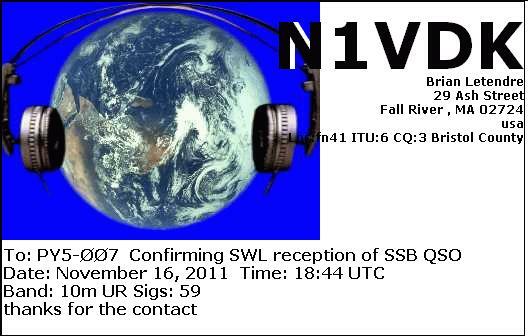 eQSL recebido: N1VDK, Fall River, MA, 28 MHz, QSO w/ ZS2CR. 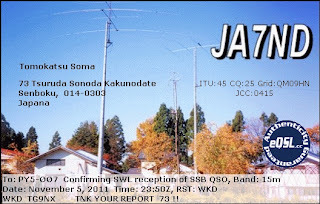 eQSL recebido: JA7ND, Semboku, Japan, 21 MHz, QSO w/ TG9NX. 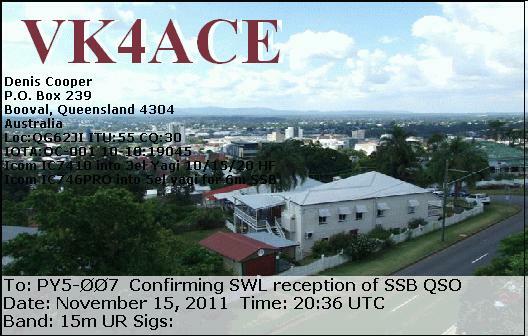 eQSL recebido: VK4ACE, Queensland, Australia, 21 MHz, QSO w/ A61BK. 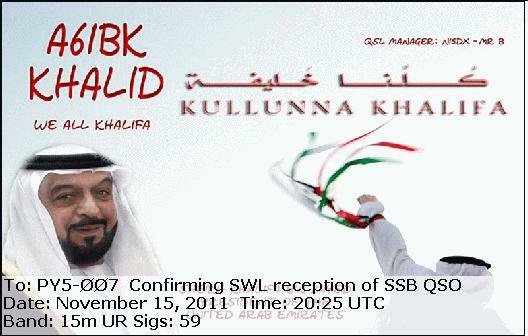 eQSL recebido: A61BK, Dubai, United Arab Emirates, 21 MHz, QSO w/ PY2RO, OZ1DG, PY2MTV, LU1JJN, PR7AH, VK4ACE, etc. 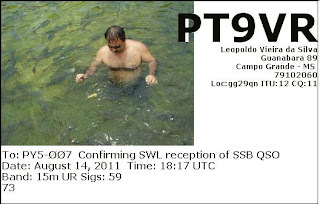 eQSL recebido: PT9VR, Campo Grande, MS, Brasil, 21 MHz, QSO w/ PS7RSA. 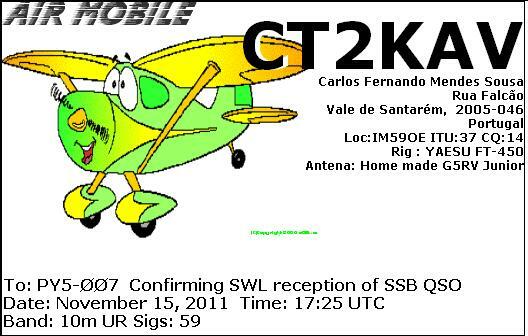 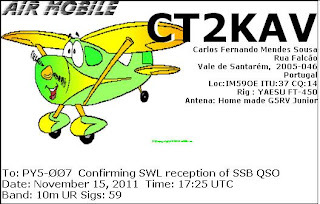 eQSL recebido: CT2KAV, Vale de Santarém, Portugal, 28 MHz, QSO w/ PY7GRM. 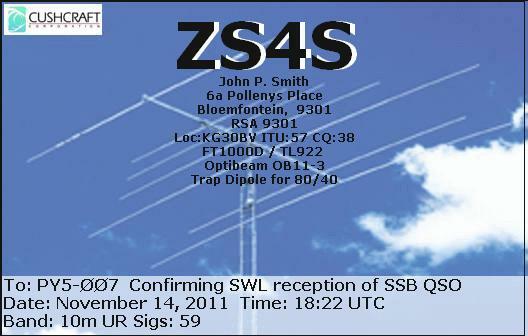 eQSL recebido: ZS4S, Bloemfonteim, South Africa, 28 MHz, QSO w/ W3FMM, KK4CQN, N1YBX, WY7LL, etc. 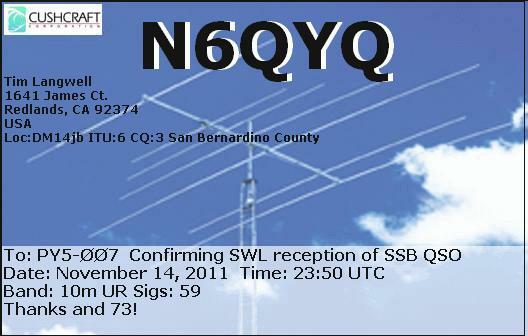 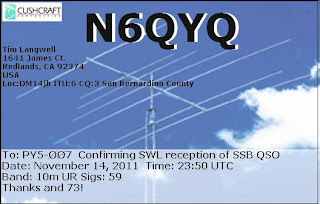 eQSL recebido: N6QYQ, Redlands, CA, United States, 28 MHz, QSO w/ JE1RXJ. 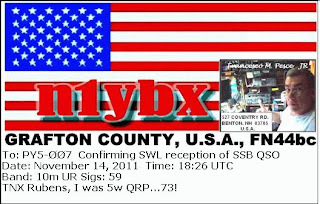 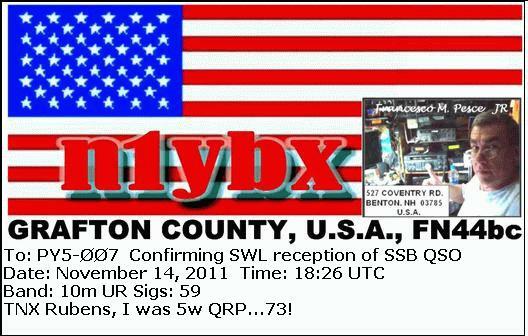 eQSL recebido: N1YBX, Benton, NH, United States, 28 MHz, QSO w/ ZS4S. 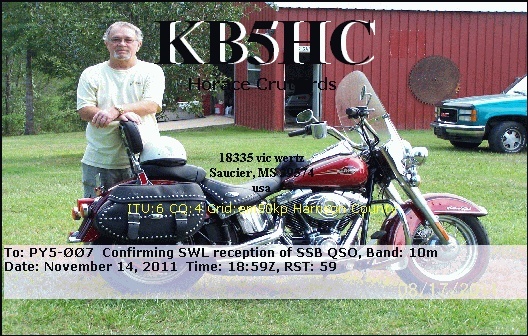 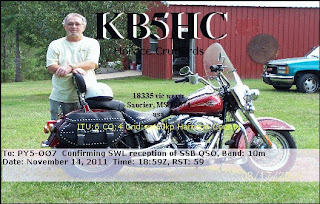 eQSL recebido: KB5HC, Saucier, MS, United States, 28 MHz, QSO w/ ZS4S. 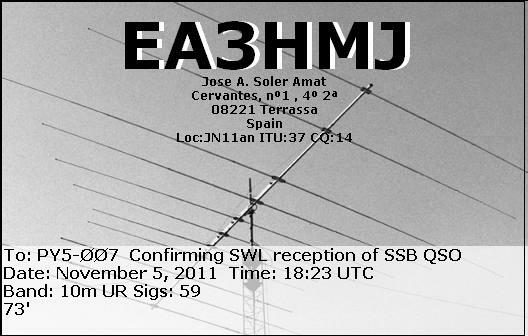 eQSL recebido: EA3HMJ, Terrassa, Spain, 28 MHz, QSO w/ CE5JZO. 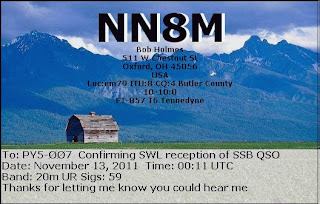 eQSL recebido: NN8M, Oxford, OH, United States, 14 MHz, QSO w/ Z24EA. 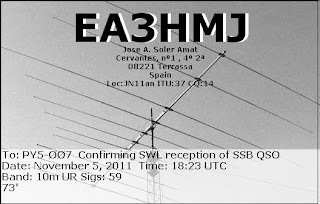 eQSL recebido: EA7IPP, El Viso del Alcor, Spain, 28 MHz, QSO w/ D2QV. 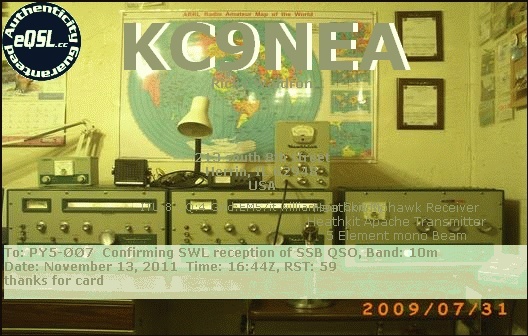 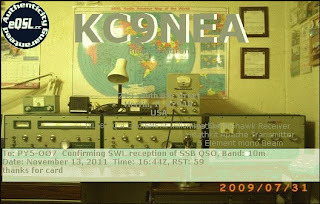 eQSL recebido: KC9NEA, Herrin, IL, United States, 28 MHz, QSO w/ TJ3AY. 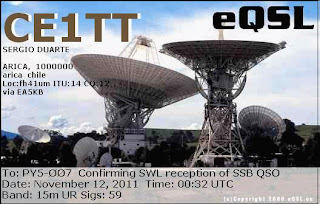 eQSL recebido: CE1TT, Arica, Chile, 21 MHz, QSO w/ JR1HUA (Japan International Dx Contest). 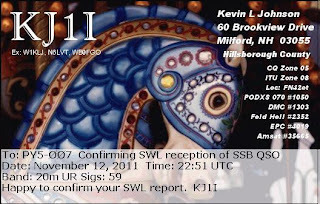 eQSL recebido: KJ1I, Milford, NH, United States, 14 MHz, QSO w/ 9Y4LAS. eQSL recebido: PY1SX, Teresópolis, RJ, Brasil, 21 MHz, QSO w/ JR1HUA (Japan International Dx Contest). 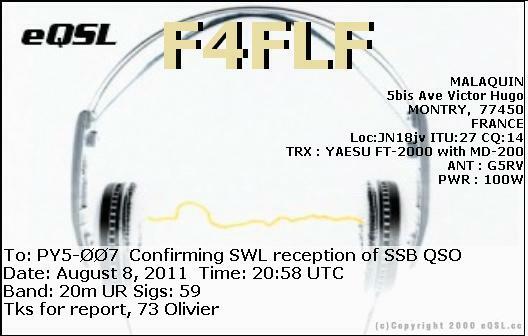 eQSL recebido: F4FLF, Montry, France, 14 MHz, QSO w/ PY6RT.